How a mineral is packaged is critical to maintaining its integrity, whether you are getting it for display or planning to commit lapidary on it. When the Post Office found the package of Anthracite (yes, coal) I’d ordered, it was all by itself in a small bin. The seams and some of the fabric were gone along with about a third of my material. 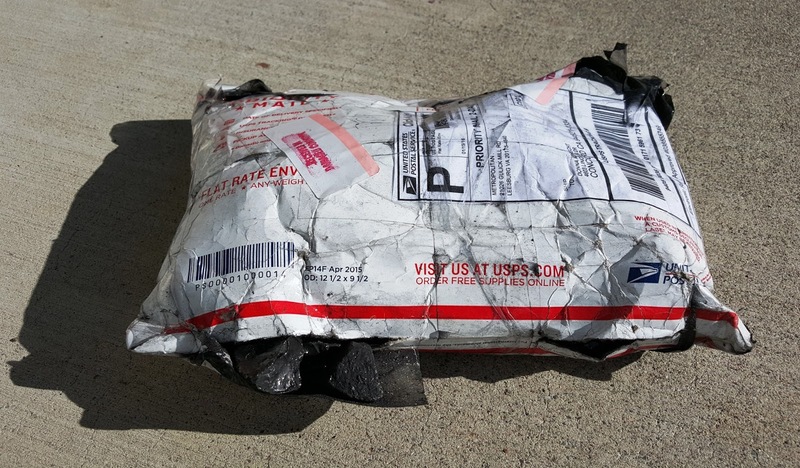 The shipper had put it into one of those presumably indestructible USPS Tyvek envelope/bags. Guess what? The Post Office is perfectly capable of destroying them and whatever they hold. To be fair, they could have been better packed. But still . . . When it didn’t arrive in a timely manner, I checked with the vendor who confirmed it had been shipped and gave me a tracking number. After I tracked it to the local main post office, I went over. No problem, they knew the package, because it was sitting in plain view. But no one wanted to deliver the mess, and although they claimed they sent me multiple cards advising me of where I could get it, somehow the cards had proved too difficult to deliver also. So this is what I finally received. Even when I'm in control of the rock constantly on its journey to my shop, I need to be sure your rock’s not rolling - and bouncing other rocks in my trunk or the back of my husband's Ford Transit Connect which has an enclosed cargo bay. Wrapping the rock individually in newspaper, towels or lots of bubble wrap is a good start for larger pieces. I then secure them in a box or other protective object and stabilized in place so they don’t go flying around when I turn a corner. For smaller rocks/slabs, wrapping them with newspaper around them and keeping them securely together in a bag is usually enough. I normally bring an assortment of little plastic display bags to keep soft minerals from rubbing on and being scratched by other rocks. When tempting stones are heavy—too heavy to carry on an airplane going home or just too large for you to manage on your own, it’s time to ship them. Some shows have on-site shippers who will handle everything from wrapping your rocks to getting them to your front porch. Warning! This is not cheap. Not even a little. However, they have the materials and shipping capability to make sure your purchases arrive intact. Another DYI tip I picked up somewhere: if you really want to be sure your item isn’t smashed or damaged, especially if it is fragile, pack it securely like the directions above. Go out and purchase a new, light weight cooler like a Coleman or Igloo brand. Put the secure package in the cooler and pad it liberally so it won’t shift in transit and put the cooler back inside the box it came in. Then all you have to do is tape it closed, label and ship! 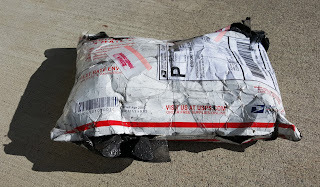 As for my damaged anthracite, I think if the Tyvek bag had been inside of a box, it would have come through fine. In case you’re wondering what I plan to do with coal, anthracite is a very hard and shiny coal. I like to do “lapidary meals” where all the foodstuffs are minerals. The anthracite was crushed quite small and put in a Coca Cola glass with selenite ice cubes to be part of a hamburger meal I’m working on. When I send the anthracite donor a complementary glass of “Coke-a-Coala”, you can believe it will be packed so that not even a tiny bit of anthracite will move in shipment. Drop me a note at Donna@LapidaryWhisperer.com and tell me about your challenges with shipping rough, slabs, finished cabs, and specimens! Oh, dear. Well, that was a mess. I LOVE the glass of anthracite Coke! It's very realistic in appearance. These are really excellent packing/shipping instructions. Thank you!